At last, some free time to catch up on reviews. I'm behind for a variety of reasons but hopefully when I've done these two I'll be able to keep up a bit better. 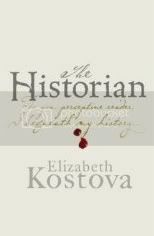 I read The Historian as part of my Halloween book challenge, almost straight after I read Dracula. It's a book that compliments Dracula very well, imo, but I'm aware that not everyone would agree. The story concerns a young woman - I'm not sure we ever learn her name - who comes across a book in her father's library. It's empty apart from an illustration of a dragon in the centre. Disturbed by the drawing the girl questions her father, who is upset to learn that she has found the book... or rather that the book has found her. Over weeks and months she gradually draws from him a very long story, despite his obvious reluctance. The story concerns the disappeareance of the father's tutor, Rossi, when the father was a student and how he went searching for him across Europe. And thus how he met the girl's mother and how the quest tied in with the history of Count Dracula. This is not a quick read. It's a story to be read slowly and savoured, not least because several histories run parallel to each other and you need to keep your wits about you while reading it. I think for me one of the best qualities of the book is that it doesn't treat its reader like an idiot. It's unashamedly about a book about people who love books and who are very well educated, and I like that a lot. Another plus for me was all the wonderful travelling depicted. I'm such an armchair traveller and lover of travel books that all the too-ing and fro-ing around Europe was definitely part of the book's attraction, imo. And it was nicely creepy - not all the way through, but enough to make it something other than a travel and history narrative and book about books.